Basel (Switzerland) – December 18, 2018 (travelindex.com) – From 2020, the Salon International de la Haute Horlogerie in Geneva (SIHH) and Baselworld in Basel, the two major events in the watch industry, will synchronise their calendars. In 2020, the SIHH will be held from 26 to 29 April in Geneva, followed immediately by Baselworld from 30 April to 5 May in Basel. The calendars have been synchronised until 2024. The coinciding of these dates is good news for the whole industry. Until now, the SIHH took place in January, while Baselworld was held in March. This arrangement meant that the professionals, press, and clients shared by large watchmaking brands would have to travel to Switzerland twice in the space of just a few weeks. This calendar now coming closer together will be effective as of 2020 onwards. For visitors attending both events, and in particular those from other continents, these agreed dates will make their trips to Switzerland far easier. This important and essential breakthrough for the Swiss watchmaking industry is also welcomed by major players in the sector. Created in 1991, the Salon International de la Haute Horlogerie (SIHH) focuses on Haute Horlogerie, and now welcomes 35 e xhibiting Maisons, 17 of which are part of the “Carré des Horlogers”. 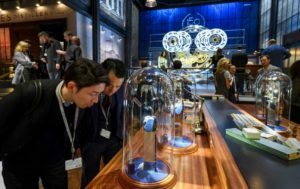 Over time, SIHH has become an unmissable platform for communication and a meeting place for the international watchmaking community: professionals, journalists, the media, collectors, en thusiasts and connoisseurs of fine watchmaking. For over 100 years, Baselworld has been The World Watch and Jewellery Show. Amongst its exhibitors are Rolex, Patek Philippe, LVMH and Chopard, alongside exhibitors who are world leaders in the do mains of jewellery and precious stones, in addition to those of technical industries.